Sigismund Dijkstra is a Gwent Card in the Witcher 3: Wild Hunt. 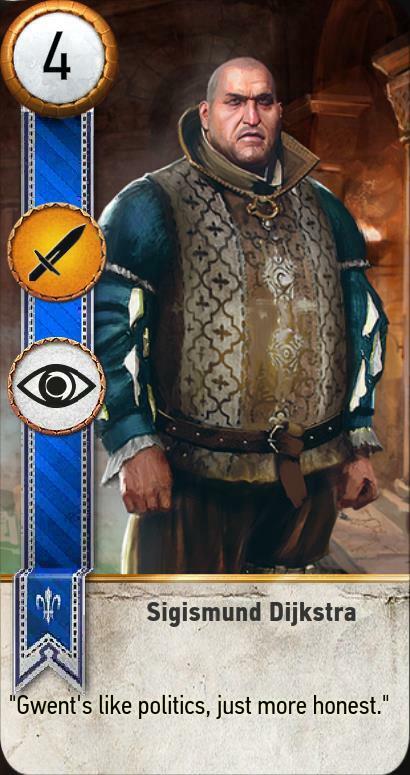 For the version in the standalone game, see Djikstra in the Gwent Wiki. "Gwent's like politics, just more honest." Special Ability: Spy: Place on your opponent's battlefield (counts towards opponent's total) and draw 2 cards from your deck. If Bloody Baron is no longer present, the card can be found in his chambers on a table against the wall.